Fire in the hole Richard Ashburn loads and fires a musket. Crazy Story "Crazy Cyot" tells the story of the crow and the coyote. Moose Sign Mike Powell shows sign language for Moose. Living History Days, held each year in May at the Museum of the Mountain Man in Pinedale, is a tremendous opportunity to learn about the everyday life of the mountain men fur trappers who lived and worked in the Rocky Mountains during the early 1800s. Each year members of the American Mountain Men come to the Museum for three days to give hands-on, historically-correct demonstrations and lively programs about a lifestyle they have spent years studying and living themselves. This year, AMM members Jim Hardee, Alan Hall, Roy Hansen, Mike Powell, Todd Glover, Richard Ashburn and Rich Williams gave living-history demonstrations throughout each day to bus-loads of school children and the public who attended. This year's program was held May 17-19th and was sponsored by Museum of the Mountain Man, BOCES and the American Mountain Men. Over 600 elementary and middle school children and adults from Green River, Rock Springs, LaBarge, Farson, Kemmerer, Big Piney and Pinedale attended this year's educational program. Members of the public also attended the three days of sessions. The American Mountain Men organization was formed in 1973 by a group of mountain man enthusiasts who wanted to learn the life of mountain men by living it. They all have regular jobs, but live and learn the mountain man ways as a hobby, and for some, a life-long passion for the lifestyle. Members live throughout the United States and have one large rendezvous each year. They rest of the year they camp in small groups whenever they get a chance to experience for themselves what life was really like for the mountain men of the early 1800s. They camp during all seasons of the year, and in all weather conditions, using only the authentic supplies of the 1820-1840 mountain man. A major part of their mission of the American Mountain Men is education, which is what brings them to Pinedale each year for Living History Days. Members also come back in July for the Green River Rendezvous, but for some, the educational programs with the kids at Living History Days is a treat they won’t miss and specifically arrange their work vacation schedules around each year. They give excellent, engaging living-history and visual demonstrations to capture the attention of elementary and middle-school age children in the hopes of sparking their interest in the lifestyle of the people of the fur-trade era. It is a great honor for the Museum of the Mountain Man to have the members of the American Mountain Men return each year to give these presentations to the school children and the community. Jim Hardee Jim comes from Quincy, California, and plans his vacation each year to come to Living History Days to spend time with the kids. He is a research specialist with the Fur Trade Research Center and past president of the Jedediah Smith Society. His presentations explain about trapping and the furs mountain men were after. He explains how locations to trap were selected, how the traps were set, using castor for bait and how the hides were prepared. Trapping was usually done in the cold of winter, working in freezing water, when the beaver fur is the thickest and worth the most money. Alan Hall Alan is from Idaho Falls, Idaho, and has been coming to Living History Days for many years. He gave demonstrations on blacksmithing and explained the importance of mountain men having skills in keeping metal tools operational for those who worked in remote country far from civilization and stores. He also explained how vital buffalo were to the mountain men and Native Americans who lived here in the early 1800s. They relied on the meat for food. The hides were used for tipi coverings, warm clothes, winter blankets and moccasins. Horns were used for cups, spoons and containers. The strong sinew taken off the back tendons from buffalo was used to make thread used for sewing. Rick Williams Rick was new this year to Living History Days, and is from Salt Lake City, Utah. He helped Alan Hall with the demonstrations on blacksmithing and tools of the trade. Roy Hansen Roy is “Crazy Cyot”, and is from Utah. 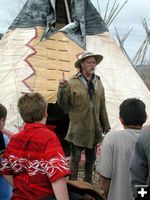 His colorful stories and tall tales about tipis and the life of mountain men delight the audience each year during Living History and Rendezvous Days. People ask why he is crazy and he replies, “because I are!” Gathered inside the replica tipis at the Museum, Crazy Cyot spins yarns and entertains kids and adults alike. He also explains the practical part of tipis, their importance to both mountain men and Native Americans for shelter and how the tipi design is carefully engineered and ventilated to allow inside fires during the cold seasons. Mike Powell is from Newdale, Idaho, near Rexburg. His demonstrations on sign language were a big hit with the kids and brought laughs and great audience participation! During his program, he taught more than 50 words and by the end had everyone making sentences using words like beaver, buffalo, antelope, moose, snake, man, woman, mountains, trade, eat and even pretty girls and stinky butts. Todd Glover “Teton” is from Salt Lake City, Utah. They call him “Teton” partly because he is tall like the Tetons, but mostly because he says the Tetons are the prettiest place he has ever seen. During Living History Days he talks about the typical Trapper Camp. Because mountain men were always on the move working trap areas, they were careful about everything they brought and had to pack. They lived outdoors in easy to set up, two-sided canvas tents, cooked on campfires, and traveled with horses and mules. Richard Ashburn Richard is from Jackson Hole. His talks about trapper guns and knives, showing how to load and fire a black powder rifle, were a great hit. Even with warning of the loud sound of the demonstration shot, everyone still jumped when it went off in a cloud of gray smoke. Richard explained the extreme importance of guns and knives to the survival of the men who lived in the mountains and had to do their own hunting, food preparation, tool working and even defend themselves from wild animal attacks. 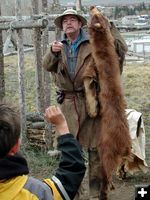 The Museum of the Mountain Man’s Living History Days help bring the era of the fur trappers and mountain men of the early 1800s to life for school children and adults during the three day living history programs and demonstrations in Pinedale. The “mountain men” who come each year love the programs with the kids and plan each year to come. The event is open to the public and a must-attend program for anyone who is interested in the fur trade era of the early 1800s and fascinating life of the American Mountain Men of today. Buffalo Alan Hall explains how trappers and Indians used different parts of the buffalo. Ramrod Alan Hall has strips tied to his ramrod so he doesn't make the mistake of shooting with it still in the barrel. Blacksmith Rick Williams shows how to make a hot fire using a hand crank blower that the kids helped crank. Teton Todd Glover is know as "Teton" because he is tall and loves the Teton Mountains. Jim Hardee Coyotes were first recorded by Lewis and Clark. Black Bear Jim Hardee explains that a black bear is not always black. Beaver Trapping Jim Hardee explains how beaver were trapped. Beaver Pelt Jim Hardee shows the hair used from a beaver pelt to make hats. Crazy Rule Crazy Cyot has one rule when he is talking, SHUT UP. Crazy Cyot Roy "Crazy Cyot" Hansen explains advantages of an Indian tipi. White Man Mike Powell shows the sign for white man simulating the brim of a hat. Mountains Mike Powell shows the sign for mountains.